His Excellency Adama Barrow, President elect of the republic of The Gambia continues to receive an out pour of congratulatory messages from institutions and communities across the country and from all walks of life. 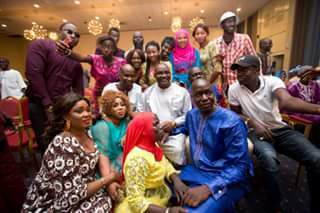 In their meeting with President elect barrow at the Kairaba Hotel, the Christian Youth Association of The Gambia congratulated Adama Barrow for his election victory, the peaceful manner in which the election was conducted, and reiterated their support to the newly elected government. President elect Barrow reassured them that The Gambia will remain a secular democratic republic. President elect Barrow remarked that "The Gambia belongs to all ethnic groups and religious denominations and that his government will uphold the democratic values that Gambians at home and abroad have been yearning for. He emphasized that "respect for the fundamental human rights of everyone in The Gambia particularly the right to freedom of worship, freedom of expression and the pursuit of happiness shall be jealously guarded" by his government. Several other delegations also visited President elect Barrow and pledged their total support to his government. These included officials from Gamcotrap, the Cattle Dealers Assiciation, the Official Tourist Guides Association, the Tourist Taxi Drivers Association, communities from Bundung, Jeshwang, the Barrow Kunda family of Pakau in Casamance accompanied by the Imam of Brikama Misira. It should be recalled that Adama Barrow was duly elected as President of the Republic of The Gambia on 2 December 2016. Since his election victory, he has received several congratulatory and goodwill messages from world leaders, foreign governments and international organizations across the world including the Secretary General of the United Nations, the African Union, ECOWAS, the European Union, and from many countries in Africa, Europe, North America and the Russian Federation. President elect Barrow will be sworn in as the third President of the Republic of The Gambia on 19 January 2016.